-> Looking for "How to remove duplicate PHOTOS from your computer"? With the amount of time we spend using computers today, and the number of files used, it is surprising just how many duplicated files are made over time. This can be bad for a number of reasons - the biggest of which being that these duplicates are taking up valuable space on your computer! It can be a pain trawling through files and folders looking for duplicate files that you don't need, so that is where a duplicate file finder like Duplicate Sweeper comes in! 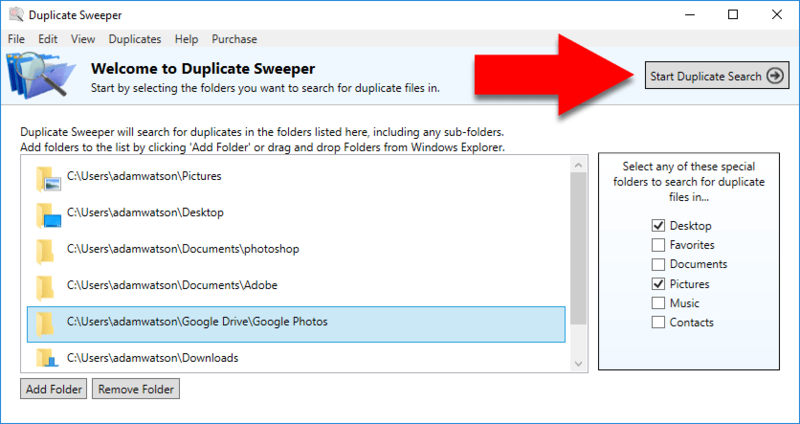 Using Duplicate Sweeper you can quickly identify and remove duplicate files on your computer. You'll be surprised just how much disk space Duplicate Sweeper can save you! It's fast, easy to use and safe. Duplicate Sweeper is a duplicate file finder for Mac and Windows PC. Duplicate Sweeper is available as a free demo download for Windows and Mac OSX. The free download version will scan your computer for duplicate photos and other file types completely free of charge. Duplicate File Finder- The first step is to select which folders you want Duplicate Sweeper to search for duplicates in. You can add any folder you like but Duplicate Sweeper helpfully provides you with check boxes to automatically select popular folders like Documents, Pictures, Contacts and more. Duplicate Sweeper can find duplicates photos, word documents, Photoshop files - just about any files you can think of! Duplicate Sweeper will display all the duplicate files found in your selected folders. The duplicates are ordered by total file size - so you can see what is taking up the most disk space on your computer. For each set of duplicate files, Duplicate Sweeper shows the number of files duplicated and how many files you have selected to delete. In the example here, the file "New Building.jpg" has been found twice. One of these files has been selected to be deleted (shown in red). For each duplicate set, you can automatically select to keep the newest or oldest file. This selection can be made on individual groups of files, for file types or for all the duplicate groups found. If you're not sure which file to keep, you can preview files content in Duplicate Sweepers preview panel. Of course all the files in a duplicate group should be the same! 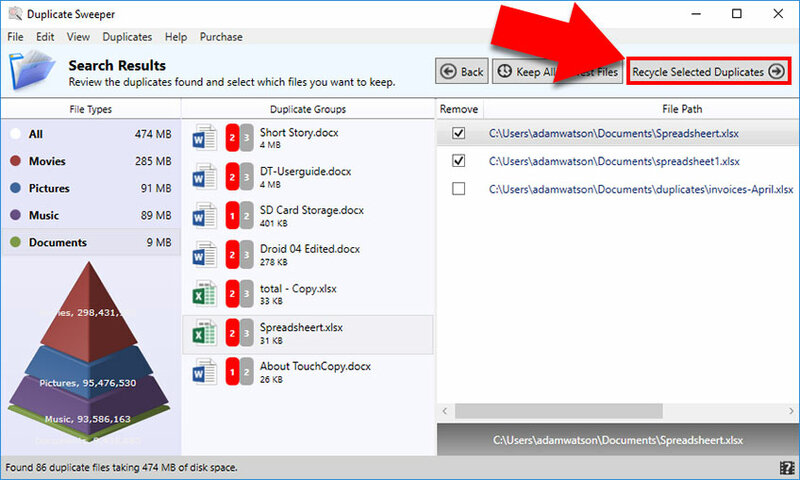 Duplicate File Remover- Click 'Remove Selected Duplicates'. Duplicate Sweeper will list all the files you have selected to remove. Once you are happy with your removal selections, clicking the "Recycle Duplicates" button will move all the chosen files to your Recycle Bin (or Trash Can on Mac), so that if needs be, you can easily recover them. Note that the full version of Duplicate Sweeper is required for the software to remove the duplicates based on your preferences. Final Note: At the moment, the files are still stored on your computer, so disk space has not been saved. To clear the space that the files were taking up on your computer, you'll need to clear them from your Recycle Bin on your desktop (or Trash Can on Mac). Make sure that you are confident that you don't need these files again, as once they are removed from the recycle bin, you will not be able to restore them to your computer.